Success in the Ontario Hockey League Priority Selection is crucial for any team who wants to build a winning franchise. The Windsor Spitfires are proving, however, that free agency is a very viable second option. At the start of the 2013-14 season, the Spitfires were coming off a season with 26 wins and were on the outside of the playoff picture. After the season was over, they were without a first-round pick in the draft due to prior sanctions handed down by the OHL and the team had to get creative. Enter the free agent frenzy. Since the start of the 2013-14 season, Windsor has brought in some key free agents and now boasts four on their roster for the 2016-17 season – forward Cristiano DiGiacinto, defencemen Jalen Chatfield and Austin McEneny and goaltender Mario Culina. Free agents are a bit of a gamble but these four are proving to be wise pickups. When you sign a free agent in any league, you’re taking a chance that the player will fit into your system, deliver the production you’re looking for and will be a proper representation of your organization. There is a risk that the player won’t deliver what you had hoped for, but if it all works out, the rewards can be outstanding. In September 2013, the Spitfires saw DiGiacinto on the Hamilton Jr. B roster and were intrigued. DiGiacinto, then 17-years-old, had just been cut by the Erie Otters and laced them up for Hamilton instead. In nine games, he had eight goals, 11 points and 37 penalty minutes. 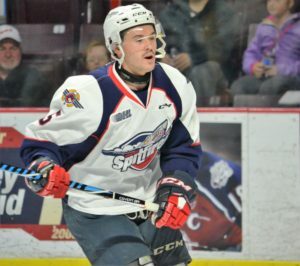 The Spitfires brass saw something in him and he was signed to an OHL contract. DiGiacinto brought instant energy to the team by showing he was a 5’11″, 190-pound ball of energy who brought offence and a bulldog mentality to the ice. In his rookie season, he had 17 goals and 28 points in 50 games, along with 101 PIM. Windsor wasn’t done there, though. In August 2014, the Spitfires invited 18-year-old free agent Jalen Chatfield (pictured, right) to their training camp. Chatfield played for the Belle Tire Under-18s in 2013-14 and showed impressive offence with 26 points in 37 games. The potential was there for a diamond in the rough and that’s exactly what Windsor got. During Chatfield’s rookie season, he put up a modest 21 points in 60 games but the pros were taking notice. 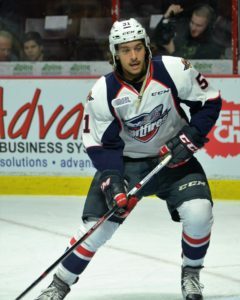 At 6’1″ tall and 187 pounds, he won’t run you over physically, but his intelligence and positioning on the ice have made him an excellent asset for the Spitfires. In 68 games for Windsor in 2015-16, Chatfield hit the 10-goal mark and added 27 assists for 37 points. What may be just as important was his plus/minus rose to a plus-22 — an increase of 41. While defence is vital to success, having reliable goaltending is just as crucial to any team. In 2015, the Spitfires continued on their free agency path by going out to get Culina from Sault Ste Marie. Culina spent the 2014-15 season with the Soo Thunderbirds of the NOJHL. 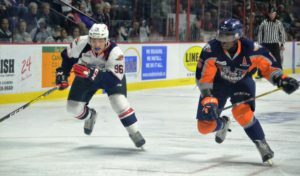 His play in both the regular season and the playoffs for the Thunderbirds got the Spitfires’ attention and he was brought to camp. He goaltender found instant success — a .902 save percentage and a goals against average of 2.64. The team was looking for veteran help though, so Culina’s playing time was limited in the first half of the season. Once January came around, he won the back up spot behind rookie Michael DiPietro. Finally, this season saw Windsor bring in McEneny shortly after he was let go from the Quebec Remparts of the QMJHL. While he’s not an imposing player at 5’11, 170 pounds, the defenceman had 42 points in 97 games for the Remparts. Being a 19-year-old, McEneny came on as a depth guy with potential for playing time. He was given an opportunity and has made the most of it. Windsor has hit it big with all four players. DiGiacinto (pictured, right #96) was noticed by the NHL and he was drafted by the Tampa Bay Lightning in the 2014 NHL Entry Draft. While he didn’t sign with Tampa, he was invited to the New York Islanders’ 2016 Rookie Camp. To date, DiGiacinto has 120 points and 325 penalty minutes in 185 OHL games. He’s turned into a leader on the team, a player the fans look up to and a guy you can count on when you need that spark. This season, he has five points and 17 PIM in nine games for Windsor. In net, Culina continues to impress for the Spitfires. For the 2016-17 season, the crease belongs to him and DiPietro. Culina, now 18-years-old, has had a strong start with a GAA of 2.99 in five starts, along with a save percentage of .910. If he continues to build his confidence, there’s certainly a career ahead of him, either in the University ranks or even the pros. Finally, McEneny (pictured, right) is showing that being released by a club doesn’t mean much in the long-run. While not the biggest player at 5’11″, 175 pounds, the 19-year-old defenceman has more than proven his worth as a steady, calming presence on the back end. He also has eight assists in 12 games to help the offence. While drafting properly is essential for any OHL club to succeed long term, finding free agents that wind up succeeding and developing can be just as rewarding. Clubs don’t spend any assets to obtain them and they can enrich a roster. These four players have given Windsor significant depth over the last four seasons and could all play a vital part in the Spitfires’ run to the 2017 Mastercard Memorial Cup. It’s a golden opportunity for the players to continue their careers and a huge opportunity for Windsor’s management to show future free agents that Windsor is a destination that could turn their career around.